Each author certifies that he, or a member of his immediate family, has no funding or commercial associations (eg, consultancies, stock ownership, equity interest, patent/licensing arrangements, etc) that might pose a conflict of interest in connection with the submitted article. A comment to this article is available at http://dx.doi.org/10.1007/s11999-016-5028-4. Severe bone loss can complicate revision TKA. A number of options have been used for managing large bone deficiencies in revision TKA including allograft-prosthetic composites  with or without hinged prostheses  and impaction grafting . Two techniques that have been described in the literature include the use of femoral head allografts [18, 25, 30] and, more recently, metaphyseal porous metal cones [16, 19, 20]. Clinical survivorship of allografts has been reported to be 81% at 5 years and 80% at 10 years . Survivorship for metaphyseal cones has been reported to be 85% to 100% [12, 16, 19] although the results are short term. To our knowledge, there are no published studies at medium term comparing these two techniques using validated patient-reported outcome measures. We therefore asked, compared with femoral head allografts, do trabecular metal cones result in (1) better validated outcomes scores; (2) a lower risk of loosening or revision at 5 years; and (3) fewer surgical complications when used for the management of bone loss in revision TKA? Ethical approval was granted by our institutional review board for this retrospective study. Between 2002 and 2008, three surgeons performed 450 TKA revisions, 45 (10%) of which were performed using augmentation of host bone; in those, femoral head allograft was used in 30 (75%) and trabecular metal cones in 15 (25%). 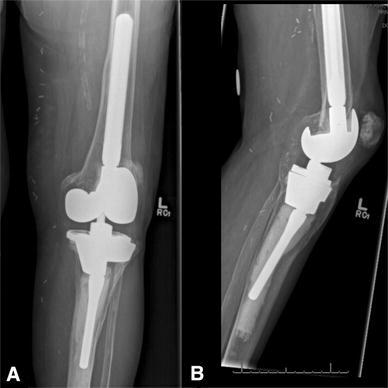 From 2002 to 2007, femoral head allografts were used in all patients (28 patients); from 2007 to 2008, trabecular metal augments were used in all patients. There was a period of 1 year (16 patients) in which there was some overlap; during that time, we used trabecular metal cones when the surgeon felt confident they would provide sufficient support, because this was our initial experience with these devices. During this time, the larger defects generally were managed using femoral head allograft. There were no exclusions. The Nexgen LCCK prosthesis (Zimmer, Warsaw, IN, USA) was used in all cases. Before the introduction of trabecular metal cones, the only available option was allograft bone. After the introduction of trabecular metal cones, these were used to augment bone stock and to allow interdigitation of the cement within the porous structure of trabecular metal. These became the preferred technique as a result of their relative ease of use; however, in cases in which we were unable to achieve a stable fit of the trabecular metal cones into the defect either as a result of the shape or size of the defect or as a result of poor bone quality or compromised bone stock, allograft was used. Indications for revision included aseptic loosening in 37 patients, instability (two patients), infection (two patients, one in each group), and periprosthetic fracture (two patients). Patients had an average of 1.5 procedures (range, 1–4) before their most recent revision surgery. Nineteen women and 25 men were included. Thirty patients (30 knees) were treated using fresh frozen femoral head allografts. Their mean duration of followup was 109 months (range, 72–144 months). Twenty-three patients (82%) were Charnley Class C and 4% were classified as Class A. At the most recent followup, average alignment was 6° of valgus (range, 4°–8°; SD 1.7). Nineteen (63%) allograft reconstructions were performed on the tibia and 11 (37%) on the femur. Trabecular metal cones were used in 14 patients (15 knees). The mean duration of followup was 87 months (range, 60–108 months). There was no difference between the groups based on age (66 ± 10 [allograft group] versus 71 ± 13 [trabecular metal cone group], p = 0.34). Eleven patients (80%) of this group were classified as Charnley Class C. Nine of these were inserted on the tibia, five were on the femur, and one patient had cones inserted on both the femur and the tibia. Mean component alignment in this group was 4° valgus (range, 1°–8°; SD 2.03). A medial parapatellar approach was performed for all cases. The medial and lateral gutters were developed and scar tissue excised. The in situ prostheses were exposed and removed carefully to minimize iatrogenic damage to the surrounding bone stock. Bone deficiencies were exposed, débrided, and classified. The surgical technique then varied according to the reconstruction method used as follows. The bone defects were defined and their size noted. The exposed sclerotic bone was débrided and the cavity contoured using hemispheric acetabular reamers. An appropriately sized femoral head allograft was prepared using corresponding female reamers, inserted into this cavity, and held with two 2-mm Kirschner wires. A burr was used to contour the medial aspect of the allograft to allow access to the intramedullary (IM) canal. The cut was then made using an IM jig resulting in a flat surface for component seating. The Kirschner wires were removed after final component cementation, and press-fit stems were used in all cases (Fig. 2). The aim of this technique was to achieve a stable press fit of the trabecular metal cone in the metaphyseal region. The shape of the defect was carefully assessed. If the shape allowed, the bone was prepared with rasps to expose the endosteal cancellous bone and a trial sleeve of a matching shape was inserted. The size of the final component was based on this. If necessary, the endosteal bone was contoured using a burr. The technique was similar for insertion of femoral and tibial sleeves. On occasion, if the tibial sleeve is deemed to be too large, it was cut to fit the defect using a metal-cutting burr. Press-fit stems were used in 12 cases and a cemented stem in one case (Fig. 3). All patients were reviewed preoperatively, at 6 weeks and 1 year postoperatively, and annually thereafter. Eight patients were unable to attend for their final review. These patients had a telephone consult during which their outcome questionnaires were completed. Their radiologic studies were performed at their local centers and sent to us for assessment. Clinical and radiologic assessments were performed at each visit. Bone defects were classified using the Anderson Orthopaedic Research Institute classification system . Knee function and quality of life were assessed using validated quality-of-life outcome measures, which included the WOMAC  and Oxford Knee Scores  and the SF-12 score . Patients were also asked to report their level of activity using the UCLA activity score . The level of comorbidity was assessed using the Charnley classification [13, 26]. Radiographs were assessed by two separate independent reviewers (NAS, PM) for signs of integration of allografts as well as loosening of the prosthesis. Failure was defined as revision for any reason. One patient treated with a trabecular metal cone did not wish to have further imaging. He was 90 years old and functioning independently at home and had no trouble with his revised knee. Otherwise all patients had radiographic followup within 1 year of their last review. 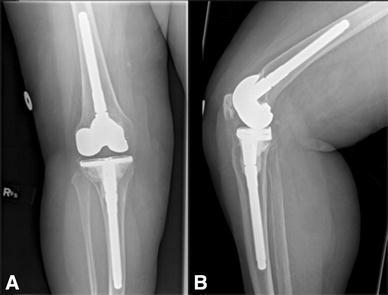 Nine Type 2A and two Type 2B femoral defects and 13 Type 2A and six Type 2B tibial defects were treated with femoral head allografts. Four Type 2B and two Type 3 femoral defects and two Type 2A and seven Type 2B tibial defects were treated using trabecular metal cones. The outcome of all patients is known. One patient in the allograft group died within 1 year of their final followup (from causes unrelated to their knee). The clinical results of this patient were included in the study. Surgical complications included superficial or deep infections, iatrogenic fractures, symptomatic deep venous thromboses or pulmonary emboli, and blood loss resulting in transfusion. These were obtained from our database and from review of patients’ charts. A post hoc power analysis was performed, which showed that a difference of 40% in the outcome measures used would be required to have an 80% power for detecting a difference between these groups with the numbers available. Statistical analysis was performed using the unpaired Student’s t-test. The level of significance was set at p < 0.05. Survival analysis was performed using the Kaplan-Meier method (Graph Pad Prism software; GraphPad, San Diego, CA, USA). The mean age of this entire cohort was 71 years (range, 44–81 years). The mean duration of followup was 87 months (range, 60–108 months) (patient demographics are presented in Table 1). * Bone defects are classified according to the Anderson Orthopaedic Research Institute classification system. With the numbers available, we detected no differences between the study groups in terms of any of the outcomes scores we measured. In terms of the mean Oxford Knee Score at latest followup, there were no differences between the allograft and the trabecular metal cone groups (80 ± 10 versus 84 ± 10, respectively; mean difference 4.2; 95% confidence interval [CI], 62–94; p = 0.29). There was no difference between the trabecular metal cone and the allograft groups based on WOMAC score (85 ± 9 versus 82 ± 14; mean difference 1.0; 95% CI, 80–105; p = 0.52) and UCLA score (6 ± 1.17 versus 6 ± 1.45; mean difference 0.15; 95% CI, 4–8; p = 0.49). With the numbers available, there were no differences between the study groups in terms of the proportion of patients who had radiographic loosening or revision surgery. We found no differences in 5-year survivorship, which was 93% (95% CI, 77%–98%) in the allograft group and 91% (95% CI, 56%–98%; p = 0.699) in the trabecular metal group. One patient who was treated with a tibial trabecular metal cone underwent revision for pain resulting from aseptic loosening at 4 years postsurgery. The cone was found to be loose at revision. No cases of subsidence were noted in any other patient up to the time of latest followup. Union of the allograft was noted from 3 months and was complete in all cases at 6 months. There were no cases of graft resorption or subsidence of the prosthesis related to this up to the time of last followup. Osseointegration of trabecular metal cones was noted at 3 months postsurgery. Bone trabeculae were noted to extend to the prosthesis surface in all but one case. This trabecular metal cone was noted to be fibrous-stable. This patient was asymptomatic. We found no differences in component alignment (4° ± 2° in the allograft group versus 6° ± 1.7° in the trabecular metal cone group; mean difference 1.7; 95% CI, −0.17 to 11; p = 0.2394) or component position up to the time of last followup. With the numbers available, there were no differences between the groups in terms of the number of complications that occurred. One patient in the allograft group sustained a periprosthetic fracture, which was treated with internal fixation. This was performed at his local hospital. This was complicated by a recurrent infection. He underwent an above-knee amputation 3 years after surgery as a result of this. Another patient died within 1 year of his final followup as a result of causes unrelated to his knee. There were no cases of iatrogenic periprosthetic fracture, blood loss resulting in transfusion, symptomatic deep venous thrombosis or pulmonary embolus, or stem tip pain in either group up to the most recent followup. TKA revision in the face of severe bone loss as a result of primary disease pathology, component design, or iatrogenic bone loss  can be technically challenging and potentially compromise component fixation and stability. Augmentation of existing bone stock sometimes is performed to improve stability of the revision prosthesis. The use of femoral head allografts and trabecular metal cones is well established, but to our knowledge, the medium-term clinical and radiologic outcomes of these techniques have not been directly compared. The results of this study demonstrated no difference between the groups in terms of outcome scores, loosening/reoperation, or complications, although the trabecular cones may have been used in somewhat easier cases. This study has several limitations. There was selection bias during the early phase of the introduction of the trabecular metal cones because these devices were used for relatively more simple, central defects reflecting a cautious and responsible way of introducing a new prosthesis. The study groups contain relatively small numbers and duration of followup differed between the two groups; the shorter followup in the trabecular metal group would tend to inflate the apparent benefits of the newer treatment relative to the older one. Our post hoc power calculation suggested that we could detect only modest to large differences between the study groups in terms of outcome scores. Two patients did not have complete radiographic followup. Of these patients, one had no issues with his knee and the other had a previous above-knee amputation. We therefore had 98% radiologic followup. The results presented in this study are also at a minimum 5-year followup and although this is longer than several published series [19, 21], it may not be long enough to capture all the modes of failure that may occur with these reconstructions. Having said that, we believe these are relevant and reflect the clinical outcomes accurately because up to 50% of all revisions tend to occur in the first 2 to 3 years [22, 27]. A direct comparison of the results of this study with those of others is not possible as a result of the use of different outcome measures among studies; however, we found a similar trend to other authors with encouraging functional scores at an average followup of 107 months (allografts) and 87 months (trabecular metal cones) (Table 2). Allografts were used for some of the larger, eccentric defects in our study; however, both techniques were associated with encouraging levels of function, pain relief, and activity levels at their most recent followup with Oxford Knee Score, WOMAC, and UCLA scores of 91 ± 10, 94 ± 9, and 6 ± 1.17 and 91 ± 14, 92 ± 14, and 6 ± 1.45 in the allograft and trabecular metal cone groups, respectively. Clinical outcomes with the use of femoral head structural allografts have been encouraging. Bauman et al. reported a Knee Society Score (KSS) of 87 points in 70 knees treated with femoral head allografts at a minimum of 60 months followup. Wang and colleagues  reported a KSS score of 90 points, which was maintained up to 76 months postsurgery, whereas Chun et al.’s group  found that the Hospital for Special Surgery score was 83 points at an average of 107 months followup. The latter authors found that the time to graft union was 6 to 7 months, in keeping with the results of this study. Alexander et al. , Bugler et al. , Huang et al. , Agarwal et al. , and Graichen and colleagues  reported statistically significant improvements in the KSS, Oxford, and WOMAC scores at an average of 2 to 4 years postsurgery in patients treated using trabecular metal cones. Kamath et al. reported a KSS score of 80 points (representing a sustained improvement of 25 points) at a minimum 5-year followup with the use of trabecular metal cones. This report is from a designer surgeon series; however, it does represent one of the longest published series with the use of trabecular metal cones. The shorter overall period of followup for the trabecular metal cones reflects the relatively recent introduction of this technology. Radiographs can underestimate bone loss ; hence, we classified defects intraoperatively after all metalwork, cement, and debris had been removed. Defects of 5 mm or less can be managed with bone cement alone or cement reinforced with screws , morsellized allograft , or modular augments . Femoral head allografts have been shown to provide superior survivorship and function when used compared with augments for Anderson Orthopaedic Research Institute Types 2B and 3 defects . In this study both techniques were used in combination with stemmed components to bypass the deficient region and obtain diaphyseal fixation. We experienced no cases of graft collapse, fracture, or disease transmission as have been reported by some authors [11, 14]. There was no difference noted in survivorship of femoral head allografts and trabecular metal cones in this study (Fig. 1). Survivorship data with the use of allografts have been encouraging into the medium and long term. Wang et al. found no failures at 76-month followup in 30 knees in a group of Asian patients. Bauman et al. , however, reported 81% survivorship at 5 years using allografts. Our longer term results compare favorably as well as those of Clatworthy et al. who reported 72% survivorship at a mean 10-year followup in 50 knees treated with allografts. Several authors have reported encouraging short- and medium-term results with the use of trabecular metal cones. Lachiewicz et al. experienced no failures at 39-month followup in their cohort of 27 knees. In larger series, Kamath et al. reported > 95% survivorship at an average 70-month followup, whereas Graichen et al. found 89% survivorship in 193 sleeves at a mean 42-month followup. The results of our study are comparable to the best published results with the use of femoral head allografts. Our medium-term results with the use of trabecular metal cones are comparable to the short-term results reported by others (Tables 3, 4). (A) AP knee radiograph shows a patient 8 years postrevision TKA using a femoral head allograft on the tibia. (B) Lateral knee radiograph shows a patient 8 years postrevision TKA using a femoral head allograft on the tibia. (A) AP knee radiograph shows a patient treated with a tibial trabecular metal cone and a cemented stem at 6 years postrevision TKA. The metal clips are the result of previous saphenous vein harvesting for coronary artery bypass grafting. (B) Lateral knee radiograph shows a patient treated with a tibial trabecular metal cone and a cemented stem at 6 years postrevision TKA. Kaplan-Meier graph illustrating survivorship in our cohorts. Numbers at risk are presented in the table. TM = trabecular metal. The results of this study suggest that both techniques are associated with few surgical complications. We experienced a lower incidence of aseptic loosening in the allograft group than Bauman et al. and Clatworthy et al. ; however, our duration of followup was relatively shorter. We encountered no failures secondary to graft resorption or aseptic loosening in this cohort in keeping with reports by Chun et al. and Wang et al. . One patient in this group fell and sustained a periprosthetic fracture 3 years after his revision. Fixation of this was complicated by a persistent infection, which ultimately required an above-knee amputation. There was one implant failure for aseptic loosening in the trabecular metal cone group. This patient had undergone a two-stage revision 4 years previously for infection. Recurrent infection was excluded. Trabecular metal cones achieve primary stability in the metaphyseal region and provide a stable platform on which to seat the tibial or femoral component. There is no risk of transmission of infection, neoplasia, or resorption of the graft with the use of trabecular metal cones. Both techniques facilitate reconstruction of bone defects and stable fixation of the prosthesis. Bony trabeculae were noted to extend to the surface of the cone in 13 of 14 patients treated with this technique in our cohort. This is in keeping with reports by other authors [5, 10, 14]. 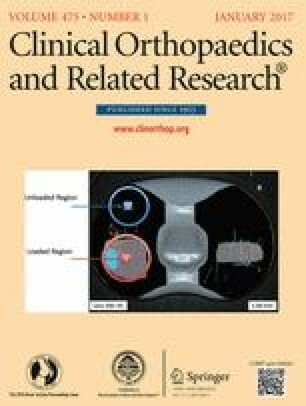 We experienced no cases of infection, stem fractures, or stem tip pain as reported by Graichen et al. .
With the numbers available, we found no difference in pain, function, or repeat revision when comparing femoral head structural allografts and trabecular metal cones for the management of severe bone defects during revision TKA. We used allografts when the bone defects were especially large. Based on these results, we believe both techniques are viable options for the management of Anderson Orthopaedic Research Institute Type 2 and 3 defects. Allografts provide comparable results when used for the management of such defects up to the medium term and allografts are a viable option when primary stability could not be achieved with the trabecular metal cones. Larger multicenter and longer term studies are required to compare these techniques as well as to determine the cost and long-term clinical effectiveness of these interventions.